You've done an amazing job. Can the ‘legals’ be conducted in Australia separately? Many assume that the Registry Office is the only option, but if you choose a Marriage Celebrant, you can have something a little bit more personal. Think of a sunset at the beach with a bottle of champagne, or lunch with a couple of family members who can’t get to Bali for your wedding – or simply sign the paperwork before indulging in a couple of beers at your favourite pub! Depending on flight times, it might be lovely to conduct the legal part at the airport before boarding your flight? 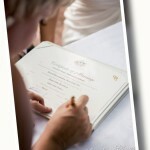 Your ‘legals’ could then become an integral part of your ‘Wedding Journey’….. However, the simplest is to have your Bali Wedding first – and then ‘finalise the paperwork’ on your return home to Australia. That way your Special Day in Bali will be where you say your vows; exchange rings and publicly declare your love and commitment to each other for the first time. Feel free to contact me for an initial, obligation free chat if you would like to know more about this. 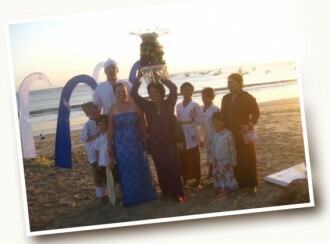 I have lived in Bali and have conducted many weddings and ceremonies there, so I can explain how things work. Generally, persons of any nationality may marry in Indonesia providing they hold one of the five religions recognised by Indonesia (Buddhism, Catholicism, Hinduism, Islam, and Protestantism). Marriages under Indonesian law are performed by religious ministers and the Catatan Sipil (civil registrar); or by the Kantor Urusan Agama (Directorate of Islamic Religion Affairs) in the case of Islamic marriages. In order for an Australian citizen (or a permanent resident who is domiciled in Australia) to marry in Bali or NTB, it is necessary to make an application at the Consulate for a Certificate of No Impediment to Marriage. Persons who wish to marry in other provinces of Indonesia are advised to contact the Australian Embassy, Jakarta. Nationals of other countries should check the requirements for their nationality with their nearest Embassy or Consulate. Australian citizens (and permanent residents who are domiciled in Australia) should apply to the Consulate in person during public office hours. In most cases the certificate can be processed on the same day. The Australian applicant is required to sign a declaration in front of a Consular Official and produce their original passport as proof of identity, along with original proof of dissolution of marriage if applicable (i.e., a decree absolute if divorced, or death certificate if widowed). The fee, payable in Indonesian Rupiah, is based on the exchange rate at the time the Application for a Certificate of No Impediment is lodged. The fee for the Certificate of No Impediment to Marriage consists of witnessing the application, preparing the certificate and translating the certificate.